Unemployment rates have been falling in the EMU. In May, the overall rate has stuck at 8.4%, its lowest mark since December 2008. In the last cycle, the unemployment rate low for the EMU was 7.3%, which it last reached in March 2008. 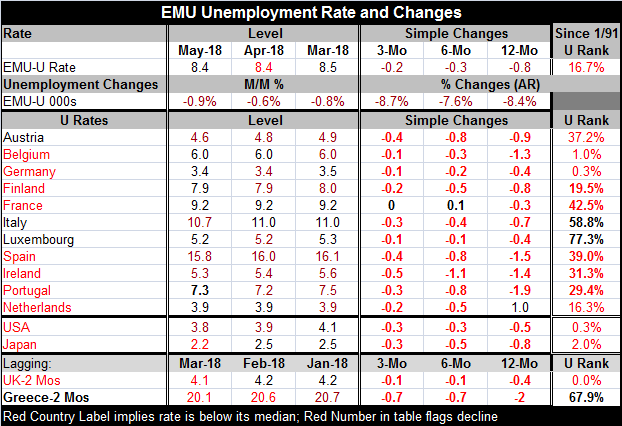 In May 2018, the unemployment rate fell in four of the EMU’s 11 early-reporting original members. However, over three months, six months and 12 months, unemployment rates are lower on balance in each of these countries. France has an unchanged unemployment rate over three months and a rate that is higher by 0.1 percentage point over six months. The Netherlands has an unemployment rate that is higher by 1 full percentage point over 12 months. Additionally, Greece, with a two-month lag, has an unemployment rate that is falling month-to-month and on three-month, six-month and 12-month horizons. An alternate method of assessment is the ranking of each nation’s unemployment rate in its queue of values since late-1991. On this basis, Germany has the lowest unemployment rate with its rate being this low or lower only 0.3% of the time. Belgium’s rate has been this low or lower only 1% of the time. The Dutch rate has been this low or lower only 16% of the time. Finland’s rate has been this low or lower 19.5% of the time. At the high end, Luxembourg’s rate has been higher only 23% of the time and the Greek rate has been higher only 33% of the time. Italy’s rate has been higher about 42% of the time. All the rest of the countries have percentile standings that are below their historic medians (50th percentile). A number of countries still have unemployment rates that have not yet fallen into the lower one third of their historic queue. That includes Austria, France and Spain in addition to the high unemployment rate countries. Unemployment rate in the EMU has fallen reasonably sharply and reasonably broadly. Few EMU countries have been truly ‘left behind.’ But there is still a core of about eight of the 12-EMU members in the table for whom the current unemployment rates would not be considered good cycle lows. The ECB is planning to end its stimulus programs and has its sights set on moving rates up and back toward the sorts of rate levels that would exist in normal times. But it has demonstrated none of urgency that we see from the Federal Reserve in the U.S. The Fed currently is ‘obsessed’ by the notion of getting the Fed funds rate back to neutral and has laid a program to get there and higher. However, that is not to deny that there is a core of pressure within the EMU that wants the ECB to sweep away all legacies of support and to begin to move rates up. But that faction is not in control of policy in the EMU. Germany is already uncomfortable about the level of inflation in Germany. And arguably the new German obsession with moving its fiscal potion into surplus has to do with trying to counterbalance a monetary policy in the EMU that may be right for the EMU but that is too stimulative for Germany.